Over a period of time, many industries have spent huge amount of resources and money for managing their server onsite and offsite as there were near to no options available in the past for this. Thanks to evolving hosting industry, we now have quite a few options available which enable these industries to offload IT tasks to specialists without the need of maintaining / managing IT equipment onsite. This will help businesses to focus on their core area when their IT requirements are taken care of by experts. Fully Managed hosting services typically include the server (VPS or Dedicated Server or Cloud Virtual Machines) along with management services bundled at one cost with one point of contact. It is important to note that not all hosting providers provide managed services since they need to have experts available on 24×7 basis to provide premium technical support and monitoring + managing the infrastructure efficiently. Hence, it is important parameter to consider while choosing a server provider along with understanding the fine print of management services provided by them (if any). We’re including few basic features of managed servers that you can look out for while shopping for best managed server hosting. 1) Initial Server Setup – Your server will be setup / provisioned as per your requirement including installing and configuring the operating system of your choice (Windows / *Nix) along with specific roles and components (web server, mail server, database server, file server, DNS, etc). 2) Initial Server Hardening / security – This is actually a key component whereby you need to ensure that your server is secured and hardened by experts. This typically includes operating system security patches, TCP/IP hardening, securing your mail / database server to avoid spamming and intrusion, disabling dangerous scripts, etc. 3) Disaster Recovery Plan – Each server and setup is typically prone to fail / crash at some point in time during its life cycle due to various internal and external factors. Using enterprise class hardware along with having redundancy wherever possible (eg. RAID for storage) helps in minimizing the impact to a great extent. However, it is important to devise an efficient disaster recovery plan to recovery as soon as possible. Typically, this should have off server daily backups with sufficient amount of retention points so that you can restore from past backups as well in case the most recent one doesn’t work for any reason. We use R1Soft server backup solution for this purpose and it has been very solid and efficient over years. 4) 24×7 Monitoring of server – You will never like to have your customers or website visitors to let you know that your website / server is inaccessible. It is very important to ensure that your server and critical services are monitored on 24×7 basis so that you can be on top of the issue before noticed by end users. We use PRTG Monitoring System which monitors health and access of each managed server on 24×7 basis. In case of any issue, our 24×7 support team is notified by email and IM system so that they can immediately look into the issue (much before the owner of server is notified by their end users or customers). 5) Managed Operating System & Software Updates – We have known that there are various threats / security alerts that are published frequently. In order to protect your server, it is important to ensure that your operating system and software is kept up to date with latest releases and updates. 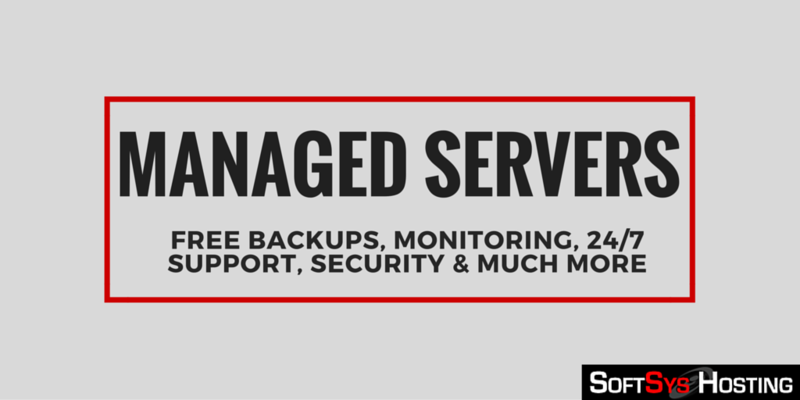 Your prospective managed hosting provider should be handling this aspect as part of managed services. 6) Regular Server Security Audits – After securing the server initially (point 2), it is also important to perform a regular audit of server to address any new security alerts and/or review firewall settings, event logs, etc to ensure that there has been no loopholes / intrusions in the server. 7) 24×7 Available Expert Technical Support Team – Each website / server owner would like to ensure that their server and website is operating smoothly at all times (most importantly while they are on vacation or taking a break or during high sales season). In case of any issues, you need to ensure that you have easy and fast access to technical support team who can look into your issues and assist you to ensure smooth operations. Technical support team should be efficient enough to be able to diagnose the issue and fix it immediately. This is a very important factor of Managed services. Since each web host will have different features / terms of managed services, it is very important that you understand the finer print of management services before falling for “Managed Server” as it is used for marketing by many hosts. Softsys Hosting provides Fully Managed Windows VPS and Managed Dedicated Servers which covers all of the above features to provide 100% satisfaction to end users and businesses. We have helped businesses to lower their IT costs by several thousand dollars as they can now leverage our feature rich managed hosting services at very affordable costs against spending on in house resources and infrastructure. The basic definition of cloud computing in simple words is – The use of computing resources, (hardware and/or software) that are deployed on a remote machine/system and delivered to the end user as a service over a network (private / public). Although the evolution of cloud computing had quite a good amount of resistance, the technology has evolved and is considered to be a future of how IT will shape up. The main advantage of cloud computing has been to help businesses to focusses on their core without the need to worry about IT issues. As data and reports suggests, this has worked very well for many industries and hence it is considered to be future of IT. Infrastructure as a Service (IaaS): This is the basic cloud service model whereby user is provided with virtual infrastructure (servers / storage or data space). Virtualization is the key in this mode as it allows IaaS-cloud providers to allocate resources as required by end users (on-demand) from their large pools of physical infrastructure of data centers. Platform as a Service (PaaS): In this this cloud service model, the PaaS-cloud providers deliver a platform or environment for development services to end users (individuals / organizations) where the user can develop and run their proprietary / in house applications. The services optionally can include operating system, a programming language execution environment, databases and web servers. Software as a Service (SaaS): In this cloud computing model, the user is provided with an access to already developed applications that are running in the cloud (managed by SaaS-cloud provider). The cloud clients and the cloud users do not manage the environment / infrastructure where the application resides which eliminate the need to install and run the application on their own computers. Network as a Service (Naas): This is not a very common model except in case of bandwidth providers. In this model, the user is provided with network connectivity services, such as VPN and bandwidth on demand. 1) Cost Savings – It helps in reducing capital expenditure on hardware and human resources which in turn reduces ROI risks. 2) Low Entry Barriers – You can simply get your cloud server to be spun up and you’re ready to go live. Various pricing options allows you to only pay for what you use / need. 3) Dynamic Scaling & Elasticity – You can easily scale your resources of your cloud server at any time which is used from the pool of resources managed by cloud provider. This enables you to purchase only required resources to get started and add more whenever you need. This is particularly helpful during seasonal sales events, etc when you can bump up your resources and scale down later. 4) Avoid management of underlying hardware / data center and backups – All of these components are taken care by your IaaS cloud provider. 5) Security – This is handled by your IaaS provider in a professional way which offloads you of securing your infrastructure. 6) Failover – This helps in keeping your service active even in case of failure of hardware components / power / network takes place since this is completely redundant in nature / setup. 7) Allows businesses to focus on core competence – Your IT requirements / setup is handled by experts which enables you to focus on key areas specific to your business and bringing innovations in it. Imagine a manufacturing firm spending resources / time on assembling / maintaining their IT infrastructure! SoftSys Hosting provides IaaS cloud services whereby the cloud users are provided with virtual infrastructure in form of cloud virtual machines with resources (RAM / Storage Space / CPU Power / Bandwidth / etc) as per their requirement. This is completely scalable service whereby users can add / remove resources at any time – almost on the fly.